Russia has not been able to capitalise on its good diplomatic relations with Iran to have a greater economic presence in the country, partly because of the sanctions imposed on the Islamic republic by the West. In this interview, the Iranian ambassador in Moscow believes that there is huge potential for the two countries to work together and boost trade. What is your assessment of the current state of Russian-Iranian relations? Russian-Iranian relations over the past 20 years have had several defining characteristics. One of them is that, despite some high and low points, the overall trend has been positive. The relationship continued to develop, and every year we have seen more understanding between our countries. A feature that we are not very pleased with is that external influences have seriously impacted Russia's policy on Iran -- mainly Russian-American relations and, in particular, the 1995 Gore-Chernomyrdin agreement (where Russia pledged to fulfill all of its existing contracts with Iran on supplying arms and military equipment, as well as providing military services, by December 31, 1999, and from that time on to not sign any new ones- Editor). It severely damaged relations between our countries. The third feature has been that the volume of our economic relations and trade does not match the level of our political engagement. When I presented my credentials to President Putin, he said that there is huge potential for our countries to cooperate economically. And we are counting on the situation to change. Our economic relations are far from ideal, trade volume has fallen. What is the reason? The decrease in trade is primarily due to the fact that Russian financial and credit institutions have taken those unilateral financial sanctions that were imposed against Iran by the U.S. and Europe too seriously. In Iran, such thoroughness is not very well regarded. A number of our companies that would like to work with Russia feel there is a lack of trust. Take Western companies, for example, they learned to circumvent these sanctions when dealing with our country long ago. Turkey took advantage of opportunities that were available and increased trade with Iran. And Russia, which had far more potential than Turkey or the West, is almost absent on the Iranian market. I really hope that in the near future Iranian-Russian cooperation will throw off these historical shackles, and will no longer be held hostage by the external relations of both Russia and Iran. What areas of economic cooperation, in your opinion, are the most promising? Economic cooperation is conventionally divided into two parts -- trade and industrial production. In both areas we have joint projects. 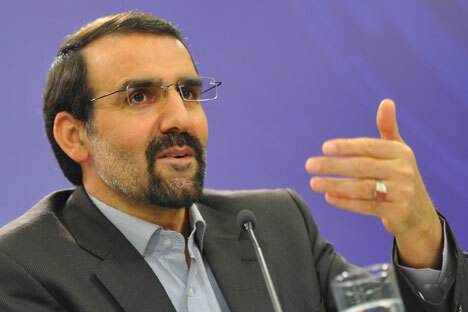 So, there is a mutual understanding on the construction of the second unit of the Bushehr nuclear power plant. There are some serious prospects in the automotive industry. We are interested in cooperating with the Russian automotive industry and are willing to make joint investments in various projects. There are prospects for extensive cooperation in the energy field. Russia can work in the Iranian oil and gas sector, buy hydrocarbons from us for some of its regions, or to invest in our industry. Russian companies have already worked on this market, but quickly folded up shop due to the sanctions imposed against us. In addition, we can cooperate on energy issues in the Caspian Sea region. Finally, we can buy a few hundred megawatts of electricity from Russia. Another area is the railways. We need hundreds of kilometers of railway tracks, and we currently are buying them from other countries, when we could buy them from you. We also want to electrify our railroads, and Russia has vast experience in this field. Finally, we need grain. Russia also could capture a significant part of this Iranian market, but unfortunately, it hasn't yet. The most sensitive issue in our relations is Russia's refusal to fulfill a contract to supply S-300s. How much did this refusal affect how Iran looks at Russia? Unfortunately, Moscow's refusal to fulfill the contract had a major impact on our relations and the perception of Russia in Iran. Russia's decision was disappointing not only for the people involved in the decision making process in our country -- the political elite, analysts, journalists -- but also the public. Iran sees this weapon as a purely defensive one, and has strongly reiterated that the contract was signed before Resolution 1929 was adopted, which, incidentally, does not cover the items discussed in the contract. We believe this contract is legitimate, lawful, and insist it be adhered to. Russia is actively returning to the Middle East, and this return is welcomed by a number of countries. What does Iran see as our place and role in the region? After the collapse of the USSR many criticized Russia for its lack of a clear and consistent policy in the Middle East. But for the past last two years and even now Russia has had a position appropriate for its status in the region, particularly with Syria. Now Russia is entering a new phase in its Middle East policy, and does so with close consultation and cooperation with Iran. Our cooperation in the Middle East has produced very good results. We hope for similar cooperation in Central Asia and the Caucasus.